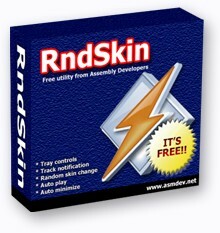 RndSkin is a simple, customizable front end for WinAmp supporting versions 2.x and 5.x. It gives you easy access to WinAmp control buttons as play, stop pause and others and can show you the current track every time it changes and when ever you want it. Additionally, you can have WinAmp playing and minimized on startup, and its skin changed. Application size is only about 11 KB, and it is so trimmed down that even with settings which are in a separate module, it's short help is by far larger then the program itself. Got tired of the icons you got in the original package or they just don't suit your Windows theme? Download additional ones from here. Installing is quite easy, just extract the icon dll file in the RndSkin directory.